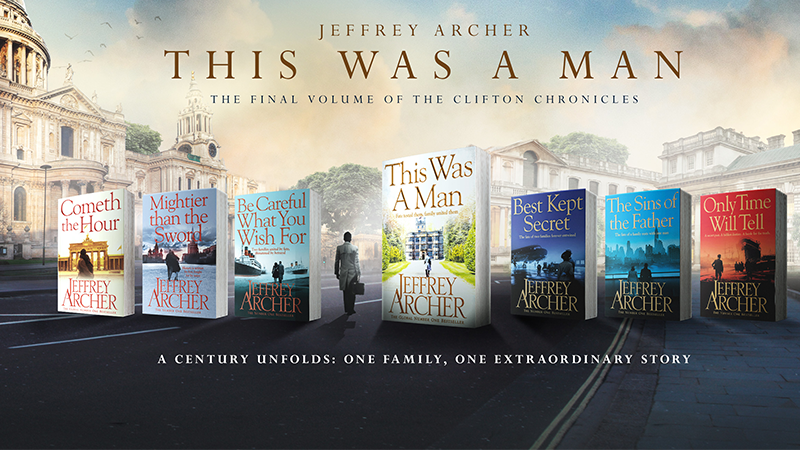 This Was a Man is the seventh and final, captivating instalment of the Clifton Chronicles from master storyteller Jeffrey Archer. Read the first chapter now. NUMBER SIX squeezed the trigger. The bullet left the rifle at 212 miles per hour, hitting its target a couple of inches below the left collarbone, killing him instantly. The second bullet embedded itself in a tree, yards from where both bodies had fallen. Moments later five SAS paratroopers stormed through the undergrowth past the disused tin mine and surrounded both bodies. Like highly trained mechanics at a Formula One pit stop, each of them carried out his duties without discussion or question. Number One, a lieutenant in charge of the unit, picked up Pengelly’s gun and placed it in a plastic bag, while Number Five, a doctor, knelt by the woman’s side and felt for a pulse: weak, but still alive. She must have fainted on hearing the sound of the first shot, which is why men facing a firing squad are often strapped to a post. Numbers Two and Three, both corporals, lifted the unknown woman gently on to a stretcher and carried her towards a clearing in the woods some hundred yards away, where a helicopter with its blades already whirring awaited them. Once the stretcher was strapped inside, Number Five, the medic, climbed aboard to join his patient. The moment he’d clipped on his safety harness, the helicopter lifted off. He checked her pulse again; a little steadier. On the ground, Number Four, a sergeant and the regiment’s heavyweight boxing champion, picked up the second body and threw it over his shoulder as if it were a sack of potatoes. The sergeant jogged off at his own pace, in the opposite direction to his colleagues. But then, he knew exactly where he was going. A moment later a second helicopter appeared, and circled overhead, casting a wide beam of light on to the area of operation. Numbers Two and Three quickly returned from their stretcher-bearing duties and joined Number Six, the marksman, who’d climbed down from a tree, his rifle slung over his shoulder, as they began searching for the two bullets. The first bullet was embedded in the ground just yards from where Pengelly had fallen. Number Six, who had followed its trajectory, located it within moments. Although every member of the unit was experienced in spotting ricochet marks or gunpowder residue, the second still took a little longer to discover. One of the corporals, on only his second mission, raised a hand the moment he spotted it. He dug it out of the tree with his knife and handed it to Number One, who dropped it into another plastic bag; a souvenir that would be mounted in a Mess that never had a guest night. Job done. The four men ran back past the old tin mine towards the clearing and emerged just as the second helicopter was landing. The lieutenant waited until his men had clambered on board before he joined the pilot in the front and fastened his seat belt. As the helicopter lifted off, he pressed a stopwatch. ‘Nine minutes, forty-three seconds. Just about acceptable,’ he shouted above the roar of the rotating blades – he’d assured his commanding officer that the exercise would not only be successful, but would be completed in under ten minutes. He looked down on the terrain below and, other than a few footprints that would be washed away by the next rain shower, there was no sign of what had just taken place. If any of the locals had spotted the two helicopters heading off in different directions, they would not have given it a second thought. After all, RAF Bodmin was only twenty miles away, and daily ops were part of everyday life for the local residents. One local, however, knew exactly what was going on. Colonel Henson MC (Rtd), had phoned RAF Bodmin within moments of seeing Pengelly leave the cottage firmly clutching his daughter’s arm. He’d rung the number he’d been instructed to call if he thought she was in any danger. Although he had no idea who was on the other end of the line, he delivered the single word ‘Tumbleweed’ before the line went dead. Forty-eight seconds later, a brace of helicopters was in the air. The commanding officer walked across to the window and watched as two Puma aircraft flew over his office and headed south. He paced around the room, checking his watch every few seconds. A man of action, he wasn’t born to be a spectator, although he reluctantly accepted that at the age of thirty-nine, he was too old for covert operations. They also serve who only stand and wait. When ten minutes had finally passed, he returned to the window, but it was another three minutes before he spotted a single helicopter descending through the clouds. He waited a few more seconds before he felt it was safe to uncross his fingers, because if the second one was following in its wake, it would mean the operation had failed. His instructions from London could not have been clearer. If the woman was dead, her body was to be flown to Truro and placed in a private hospital wing, where a third team already had their instructions. If she had survived she was to be flown to London, where a fourth team would take over. The CO didn’t know what their orders were and had no idea who the woman was; that information was way above his pay grade. When the helicopter landed, the CO still didn’t move. A door opened and the lieutenant jumped out, bending double as the blades were still rotating. He ran a few yards before he stood up straight and, seeing the colonel standing at the window, gave him a thumbs up. The CO breathed a sigh of relief, returned to his desk and phoned the number on his notepad. It would be the second and last time he spoke to the cabinet secretary. ‘Good evening, colonel,’ said Sir Alan. ‘No, thank you,’ said Giles, who was only interested in one thing: finding out why the cabinet secretary had wanted to see him so urgently. Giles hadn’t heard those words since he’d been a cabinet minister, but he didn’t need reminding that whatever he and Sir Alan were about to talk about could never be repeated, unless the other person present was also a privy councillor. One broken window and a moment later the six of them were inside. They didn’t know exactly what they were looking for, but when they saw it, they wouldn’t be in any doubt. The major in charge of the second unit, known as the litter collectors, didn’t carry a stopwatch, because he wasn’t in a hurry. His men had been trained to take their time and make sure they didn’t miss anything. They were never given a second chance. Unlike his colleagues in unit one, they were dressed in tracksuits and carried large black plastic bin liners. There was one exception, Number Four – but then he wasn’t a permanent member of their unit. The curtains were all drawn before the lights were turned on and the search could begin. The men meticulously dismantled each room, swiftly, methodically, leaving nothing to chance. Two hours later they had filled eight plastic bags. They ignored the body that Number Four had placed on the carpet in the front room, although one of them did search his pockets. The last things they went through were the three suitcases that had been left standing by the door in the hallway – a veritable treasure-trove. Their contents only filled one bag, but contained more information than the other seven put together: diaries, names, telephone numbers, addresses and confidential files that Pengelly had no doubt intended to take back to Moscow. The unit then spent another hour double-checking, but came across little else of interest, but then they were pros, trained to get it right first time. Once the unit commander was convinced they could do no more, the six men made their way out of the back door and took separate well-rehearsed routes back to the depot, leaving only Number Four behind. But then he was not a litter collector, but a destroyer. When the sergeant heard the back door close, he lit a cigarette and took a few drags before dropping the glowing stub on to the carpet next to the body. He then sprinkled the fuel from his lighter on to the dying embers and moments later a blue flame leapt up and set the carpet alight. He knew it would spread quickly throughout the small timbered cottage, but he needed to be certain so he didn’t leave until the smoke caused him to cough, when he walked quickly out of the room and headed for the back door. After he’d left the cottage he turned around and, satisfied the fire was out of control, began to jog back to base. He wouldn’t be calling the fire brigade. All twelve men arrived back at barracks at different times, and only became a single unit again when they met in the Mess for a drink later that evening. The colonel joined them for dinner. The cabinet secretary stood by the window of his office on the first floor and waited until he saw Giles Barrington leave No.10 and set off purposefully along Downing Street towards Whitehall. He then returned to his desk, sat down and thought carefully about his next call, and how much he would reveal. Harry Clifton was in the kitchen when the phone rang. He picked it up, and when he heard the words, ‘This is Number Ten, would you hold the line please,’ he assumed it would be the Prime Minister for Emma. He couldn’t remember if she was at the hospital or chairing a meeting at Barrington House. Harry assumed ‘no longer an issue’ was a euphemism for ‘Pengelly has been eliminated’, and even though there were several questions he would have liked to ask the cabinet secretary, he kept his counsel. He knew that a man who kept secrets even from the Prime Minister would be unlikely to answer them. After Giles had left No. 10, he made his way quickly back to his home in Smith Square. He was relieved it was Markham’s day off, and once he’d opened the front door, he immediately went upstairs to the bedroom. He switched on the bedside light, drew the curtains and pulled back the top sheet. Although it was only just after six o’clock, the street lamps in Smith Square were already ablaze. ‘I am,’ said Giles, as two men emerged from the back of the van and gently offloaded a stretcher. ‘Follow me,’ said Giles, leading them upstairs to the bedroom. The two orderlies lifted the unconscious woman off the stretcher and placed her on the bed. Giles pulled the blanket over his wife, as the stretcher bearers left without a word. ‘I already have,’ said Giles, before accompanying Dr Weeden downstairs and opening the front door. The two men shook hands a second time before the doctor climbed into the front of the black van without a backward glance. The anonymous vehicle drove slowly round Smith Square then turned right and joined the heavy evening traffic. Once the van was out of sight, Giles closed the door and ran back upstairs. He pulled up a chair and sat down by his sleeping wife. Giles must have fallen asleep because the next thing he knew Karin was sitting up in bed and staring at him. He blinked, smiled and took her in his arms. ‘It’s all over, my darling. You’re safe now,’ he said. ‘I thought if you ever found out, you’d never forgive me,’ she said, clinging on to him. ‘Alan Redmayne has already fully briefed me,’ said Giles, trying to reassure her. Only the British, thought Karin. This Was a Man is out now in Paperback, Ebook, and as an Audiobook!